Goodgear supply many Aboriginal organisations on the Central Coast with branded uniforms and printed promotional products all year round. We take pride in our uniforms and merchandise products that we supply to our local community, and we get excited to supply high quality promotional products for NAIDOC Week. Goodgear have supplied merchandise for NAIDOC Week to organisations across the Central Coast, Newcastle and Sydney regions. 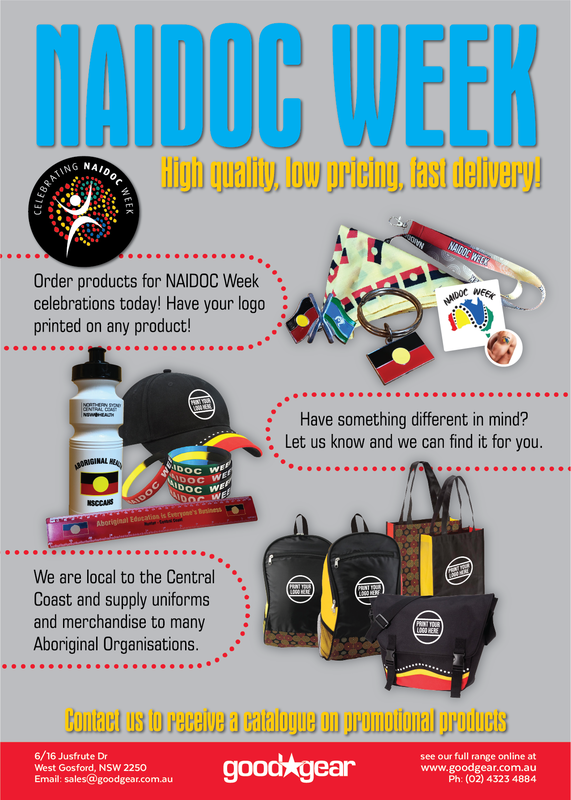 Our top products for NAIDOC Week include caps with embroidery, screen printed NAIDOC tees, printed water bottles, lanyards with NAIDOC week printed, printed silicone wristbands with NAIDOC week and logo printed, umbrellas printed with NAIDOC Week and logo and many more. We supply printed tees for NAIDOC Week. If you are looking for a t shirt with NAIDOC Week 2018 printed, with your logo or message, contact Goodgear today. We have a wide range of t-shirts available for screen printing, available in a range of colours, sizes and that suit all budgets. Check out our NAIDOC Week specials below to see some of our suggestions for promotional products for NAIDOC Week 2018. If you have a specific promo product in mind, or you would like something different to our suggestions below, contact us to speak to an account manager who can work with you to find the perfect NAIDOC Week 2018 promotional products for you and your community.